Sugar. Milk. Eggs. Scharffen Berger chocolate. Butter. Flour. Vanilla. Salt. What is that? The ingredients in one of the greatest desserts I have eaten in my life. 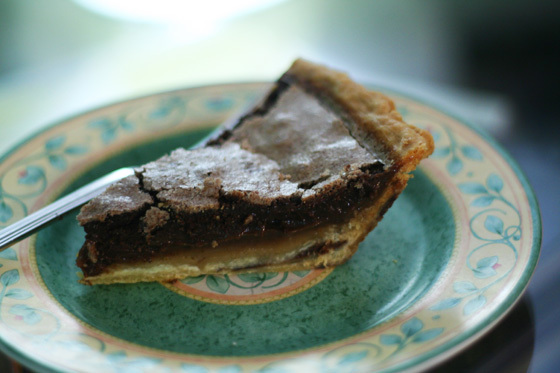 It is a chocolate chess pie, courtesy of Zingerman’s Bakehouse. I ordered one ($25) to share with my family for Christmas. This pie is really special. You may not have heard of such a treat if you’re not from the South, but when we were looking for traditional American desserts to make for Zingerman’s Roadhouse this one came up and its been on the menu ever since. 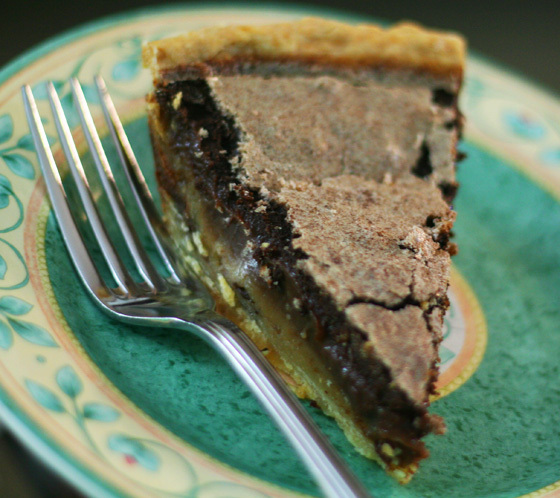 We make a rich chocolate custard with Scharffen Berger dark baking chocolate and bake it in a buttery crust. Top it with some fresh whipped cream and maybe a few berries. This thing is absolutely, positively, incredibly delicious. It’s like a brownie, custard, and fudge rolled into one sadistically amazing treat. After tasting the chocolate chess pie, I did a double-take on the list of ingredients. How can anything so good be composed of so little? Not to mention that the ingredient list also includes what is in the crust. Chess pie is a particularly sugary dessert characteristic of Southern U.S. cuisine. According to James Beard’s American Cookery (1972) chess pie was brought from England originally, and was found in New England as well as Virginia. Recipes vary, but are generally similar in that they call for the preparation of a single crust and a filling composed of eggs, butter, granulated sugar, brown sugar and vanilla. What sets chess pie apart from many other custard pies is the addition of corn meal. Some recipes also call for corn syrup, which tends to create a more gelatinous consistency. The pie is then baked. The result is very sweet and is often consumed with coffee to offset this. Chess pie is closely related to vinegar pie, and the two terms are often used interchangeably. Vinegar pie generally adds somewhere between a teaspoonful and tablespoonful of vinegar to the above ingredients to “cut the sweetness”. Some variations are called Jeff Davis or Jefferson Davis Pie. Afterward, I became nervous about sugar overload. The full pie is approximately 3000 calories, which surprisingly is quite reasonable given the caloric-dense nature of desserts. So my slice (about 1/8 the pie) was in the range of 400 calories. Clearly, the enjoyment of another slice was called for and well-justified. I am now on a mission to replicate Zingerman’s preparation of this dish. The two keys to their success are the crust, and the Scharffen Berger chocolate. Admittedly, I am nowhere near as good at crust-making as the seasoned bakers at Zingerman’s, so that will take some time. Scharffen Berger is on the expensive side for chocolate and somewhat challenging to find at retail grocery store, so do your homework ahead of time (or just use another baking chocolate, like Ghiradelli). Some online research has led me to this recipe, which I think I will start with (minus the creme de cacao). I’ve been making different kinds of chess pie for most of my life; it’s like pecan pie without the pecans in it. I think vinegar pie is similar, and transparent pie is similar. It’s just slightly different proportions of the different ingredients and consistencies, otherwise it’s the same thing: the magic of sugar mixed with butter mixed with eggs thrown in a piecrust. Preheat oven to 350 degrees. In a saucepan over low heat, melt butter and chocolate. Remove from heat. Blend in sugar, eggs, liqueur, flour, salt and vanilla extract into melted butter and chocolate. Beat until smooth. Pour into the pie shell. Bake for 30 to 35 minutes or until set. Cool on a wire rack for at least 30 minutes.